Peanut milk is one option to try if you follow a casein-free diet because, contrary to its name, it does not contain real milk. This beverage is made by blending peanuts with water and adding sweeteners or seasonings such as cinnamon. Peanut milk provides some nutritional benefits you won't get from cow's milk. It's a good source of vitamin E, has at least double the amount of magnesium and vitamin B-6, and is packed with heart-healthy unsaturated fats. In spite of its nutritional benefits, peanut milk should be consumed in moderation because 1 cup has about 214 calories, with 162 of the total calories coming from fats. On the positive side, most of the fats in peanut milk consist of healthy unsaturated fats that lower blood levels of cholesterol and raise good cholesterol. Peanut milk retains the nut's natural soluble fiber, which also helps lower cholesterol. You can expect to get 3 grams of total fiber, or 12 percent of the daily value, based on a 2,000-calorie-a-day diet. Magnesium facilitates hundreds of metabolic processes in your body, where it helps produce energy and ensures your muscles, nerves and heart keep working. It also helps lower your blood pressure, and it's essential for strong bones. Peanuts are good sources of this important mineral. Depending on how many peanuts you use to make peanut milk, a 1-cup serving should contain around 65 milligrams of magnesium. Based on consuming 2,000 calories daily, this amount provides 16 percent of the daily value. When you digest fats, they're tucked inside an outer covering made from fats and proteins. These lipoproteins transport cholesterol and other fats through your bloodstream. Vitamin E is an antioxidant that helps protect fats from reactive molecules commonly known as free radicals. By neutralizing free radicals before they cause damage, vitamin E helps maintain the structural integrity of lipoproteins. As a result, they don't release cholesterol that can stick to blood vessels and lead to cardiovascular disease. One cup of peanut milk contains about 2 milligrams of vitamin E, or 13 percent of the recommended dietary allowance of 15 milligrams. Your body depends on vitamin B-6 to activate more than 100 enzymes that trigger metabolic reactions. Some of these B-6-dependent enzymes help make hemoglobin for your red blood cells and synthesize amino acids and neurotramsitters. Vitamin B-6 also helps convert an amino acid -- homocysteine -- into other beneficial substances. In this role, it lowers blood levels of homocysteine, which is beneficial because high levels of homocysteine increase your risk of cardiovascular disease. Peanut milk provides about 10 percent of the daily value of vitamin B-6. 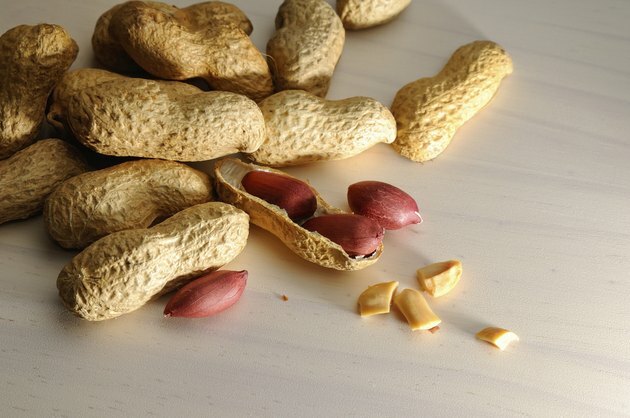 Can Peanuts Cause IBS or Diarrhea? Can You Take a Multivitamin With Milk?